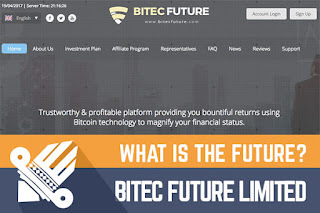 DavidNews HYIP blog - News & Reviews: Bitec Future Limited – What is the future? Bitec Future Limited – What is the future? Last week a HYIP called Bitec Future Limited joined DavidNews.com Standard listing. It has been online already for six days and I must admit that the first impression of this website is - through quality and an investment plan I have never seen before. I have reinvested in this program $200 and will keep you informed about the further performance of this program. And now I would like to take a better look and see if the details are as neat as the first impression of this website. As I mentioned in the first paragraph, Bitec Future Limited has unusual investment plans. Mainly, you see floating or fixed interest rates, but in this case, it’s kind of a combination of both in one plan. It’s easier to choose a plan if you have decided to take chances by investing in a HYIP, but it makes it more difficult to calculate the daily profit and when deposited money will reach the break-even point. Bitec Future Limited offers interest rate starting from as low as 1% and up to 8%. There is nothing unusual about it, but you need to keep in mind that 8% rate is applied only after the 8th day of deposit. It’s quite confusing and I want to do a quick calculation, to give you a better understanding of a potential return and a daily income. For example, $200 investment in the only plan this HYIP is offering will generate from $2 to $14 a day for the first 7 days, which is in total $56. Starting from the 8th day this deposit will be making $16 a day. I did a calculation and found out that such investment will reach its break-even point after 16 days. Therefore, everything after that will be a profit. Of course, in case this program will be a long-term one. In the last scenario, the deposited amount of money after 30 days will become $400. Of course, it looks great, but we can’t predict the development of this program in the following 30 days. Social presence most likely has been boosted, to gain better results in short time. Bitec Future Limited has a Facebook page with 220 likes and 3 posts, but the Twitter account has around 750 followers and only two tweets. Sure, there is a way to gain a such number of followers, but it takes extra time. However, any admin wants the program to go viral. In the meanwhile, the company has a Certificate of incorporation assigned by Companies House and there is matching company information on the Companies House website. My main goal is to gather information about the HYIP and provide it in the review. 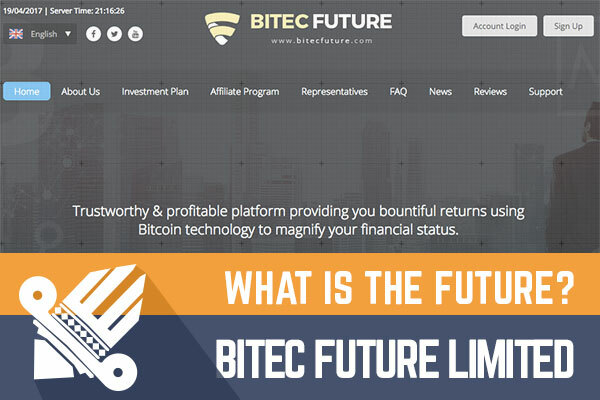 The technical side of Bitec Future Limited looks good quality and the admin has done a great job with this website. However, it has no impact on the potential outcome of this program and it has nothing to do with programs life in seconds, hours or days. As I wrote earlier, it has an unusual investment plan, which I haven’t seen yet. However, it makes hard to calculate break-even point for deposited money. Moreover, for first 8 days, the program is paying comparably low % rates. Always remember to calculate daily revenue and break-even point, to understand real revenue. As usually, remember that all HYIP’s are highly risky and you are the only person responsible for your investments. Therefore, if you ever decide to make any investments, don’t invest more than you can afford to lose! Investment plans: 1% up to 8% daily for 30 days (100% profit in 30 days), more information in the review. Join Bitec Future Limited Here! You should remember that the best Bitcoin exchange service is YoBit.